As winter continues to roll in, so do the fantastic looks of different high-end fashion brands. Givenchy specifically has been working hard to impress audiences, and their fantastic looks can be easily recreated with garments from inexpensive stores. Style Advice: Trying to recreate an outfit similar to Givenchy’s looks should not be too hard, as the brand has recently focused on various straightforward approaches. First, begin with Zara’s Snake Print Shirt ($50), as it will provide a good bit of color to your outfit before we move on to more muted colors. Stay on Zara’s site and pick up the Blue Suit Jacket ($149) and the Blue Suit Pants ($80), as the matching set will help bring a little more consistency to the outfit. Accessories are key to really finishing off this outfit on a high note, so before you leave Zara, make sure you buy the Black High Tops With Fleece Lining ($90), as they’ll be a comfortable pair of kicks that are just as fashionable as they are flashy. One of the most notable elements of Givenchy’s look is the bag, in which I’d recommend the Moleskin Horizontal Device Bag ($100) from Urban Outfitters. Must Have: If you’re looking to pick up a sleek accessory this winter, check out Gucci’s Silver Angry Cat Ring (560 CAD). A band ring in sterling silver, this showstopping piece has its personal logo sculpted and engraved throughout the ring. Purple crystal cut detailing is evident at the face of the cat, as well as a Gucci logo engraved on the inner band. The ring is medieval inspired and hails from the Gucci Garden collection available on SSENSE.com. 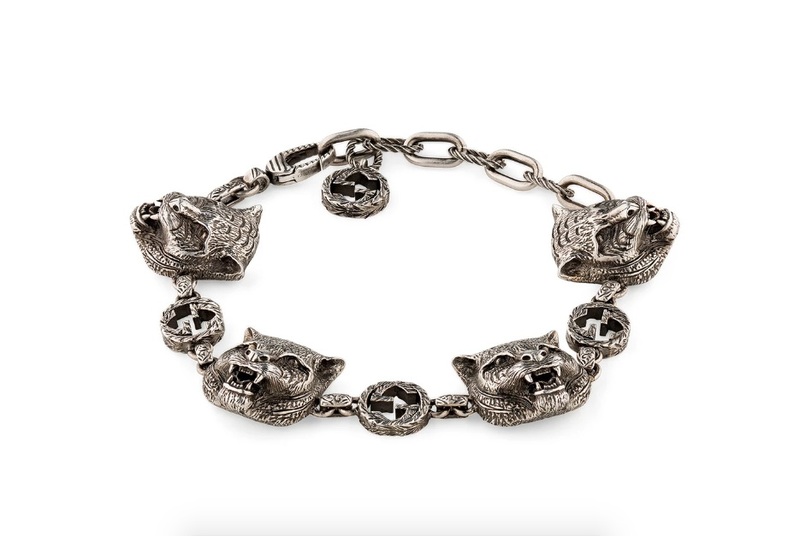 Besides the ring, a bracelet is also available featuring a dangling “GG” Gucci Charm and four angry feline heads matching three “GG” links. Industry Update: Only a mere two years after joining the Calvin Klein team for its first ever chief creative officer position, Raf Simons has made his departure. A swiftly made decision with only a few days left in 2018 and 8 months left in his contract, Simons’ split with the american fashion brand comes as little surprise to both parties involved. The Calvin Klein brand has been recently criticized for its lackluster financial performances, and it was expected for Simons to be primarily blamed for any and all shortcomings. "Both parties have amicably decided to part ways after Calvin Klein Inc. decided on a new brand direction which differs from Simons’ creative vision," the brand said in a statement to Business of Fashion. A representative for Simons declined publications’ requests for a personal comment on the matter. It has also been noted by insider sources that Calvin Klein will not participate in presenting a collection for the Fall 2019 season, as the brand is expected to regroup and prioritize their focus on new and fresh ventures.